We can finally do a legal 75 mph in California. After years of towing bikes around on small trailers and paying for upkeep and replacement on tires, wheel bearings and trailer lights, we recently decided to invest in a receiver hitch carrier for the new MoJazz dually. 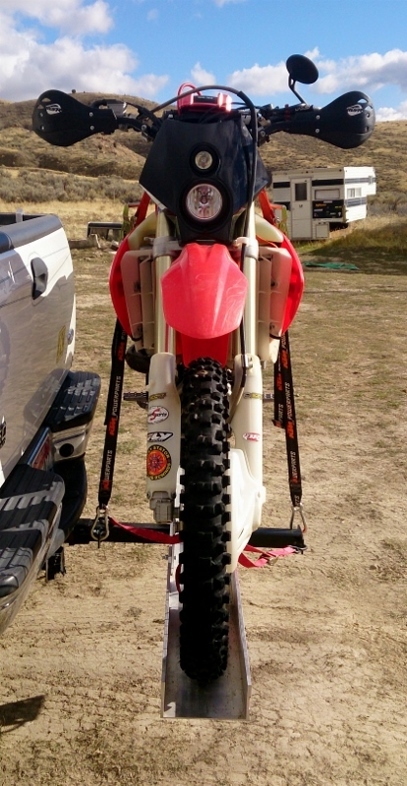 A recommendation from ace counterman Brian Jablonski at Pocatello PowerSports steered us to the Travelrite Travel Rack. After four months of steady use we have no complaints. The Travelrite is just about everything that it's cracked up to be. It is light, sturdy, and no problem to load by oneself. The Travelrite Travel Rack fits any class III hitch. It is very lightweight, thanks to an aluminum rail, yet it exceeds class III hitch standards. It is rated for 400 lbs* and, at least ostensibly, needs only two tie downs to secure a bike to the rack (we feel that a third strap to secure the front wheel to the chock is necessary). 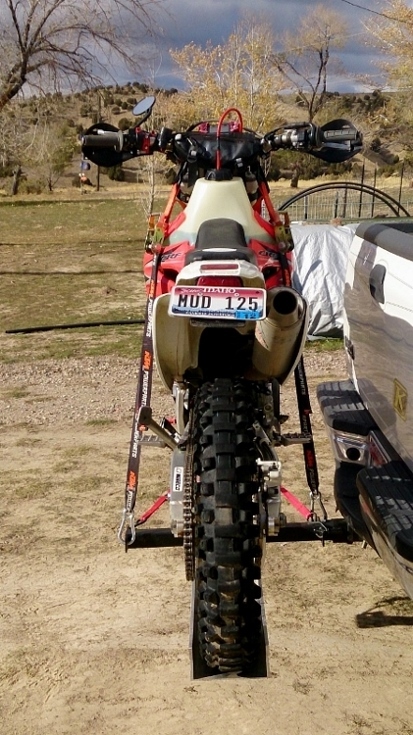 We use heavy-duty KTM ratcheting straps for securing the bike to the rack and a light-duty tie down to secure the front wheel against the front wheel chock. No bike that we've secured to this carrier in this manner has budged an inch in thousands of miles of travel. 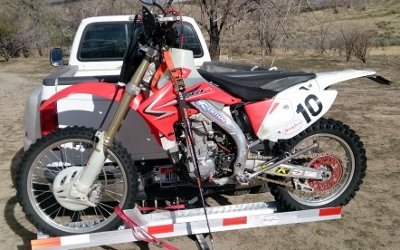 A ramp is available as an option but is not included with the basic rack kit. We use half of an old atv ramp that's easy to push a bike up and works just fine with the rail. It takes a try or two to get a bike up on the rail and over the fold down front wheel chock without it rolling off the other side, but once this is accomplished the rest is pretty easy. Just make sure that you use straps that you trust since a strap failure would be catastrophic. We also cannot recommend highly enough that you use a third strap to secure the front wheel to the front wheel chock. One member of the MoJazz staff managed to jettison a bike on a bumpy mountain road before we hit upon the idea that the third strap was actually pretty necessary. The only reason that number isn't two bikes is sheer luck. The only complaint that we have is that even with the locking collar, the Travelrite still rocks back and forth quite a bit while in use. While we doubt that this causes any actual harm, it is a bit disconcerting when you check your mirrors - until you get used to it. Make sure that you don't leave your ramp behind because loading a bike without the ramp, without dinging your tailgate, is tricky without help. The Good: Very light weight. The Rad: Exceptionally well-designed and well-made. The Gnarly: You actually need three straps (trust us). * The tongue weight of a receiver hitch is rated for the normal distance from the hitch to the ball. The rail on this rack is about twice that distance, so your hitch would need to have a minimum tongue rating of 800 lbs for the rack to safely accommodate its maximum capacity. Most truck hitches exceed this, but hitches found on some SUV's and many cars might not. Check the rating of your hitch to be sure.